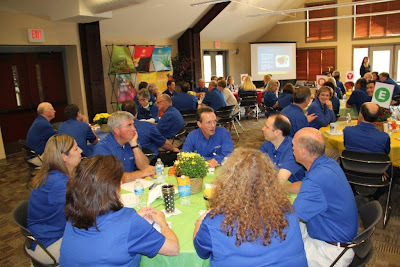 Yesterday was another great day in the life of Creation Health - Greene County! I had the pleasure of setting up a table at the John Deere Wellness Fair, where I passed out Creation Health books and information to employees and their families. The best part was promoting our FREE Creation Health mobile app for iPhone and Android. Check it out here and be sure to download it to your smart phone. Let us know if you need a vendor at your next event! 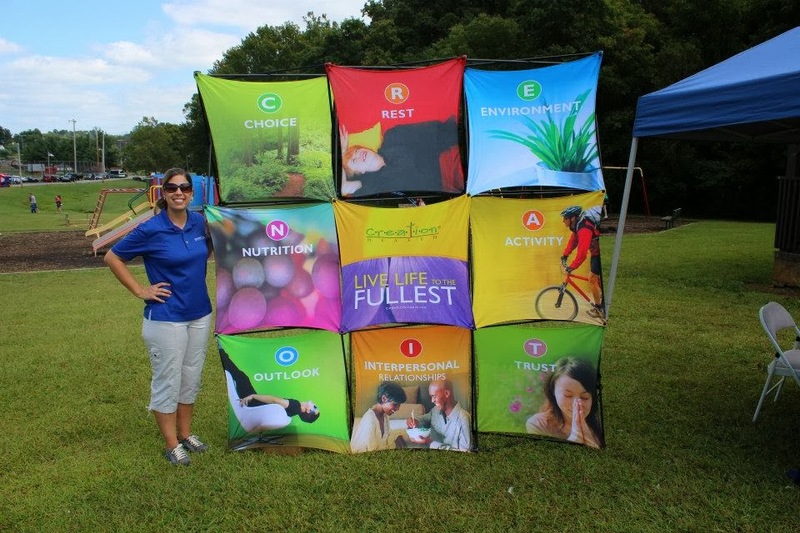 The Greene County Health Council + Kids Day = More Opportunities! 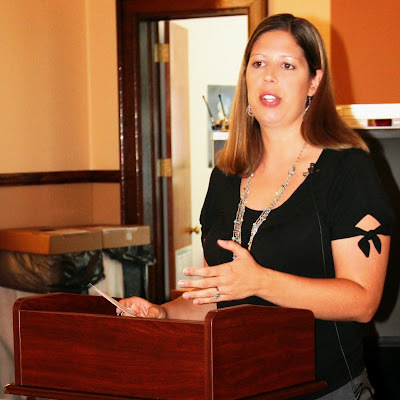 I was so excited to attend my first meeting of the Greene County Health Council last week! Not only did I eat a great lunch and hear an informative speaker, but I was able to meet so many others from the area who are in the health care industry, who will be great contacts for me in the future and some who already have ideas of how we can work together! Yay! 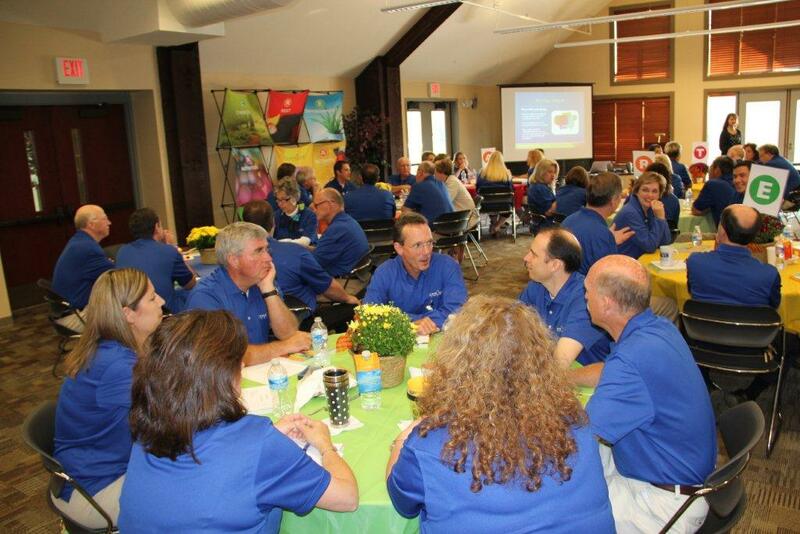 Several of these same people were also with me at Hardin Park for Kids Day on Sunday! A Week Full of Speaking Engagements! 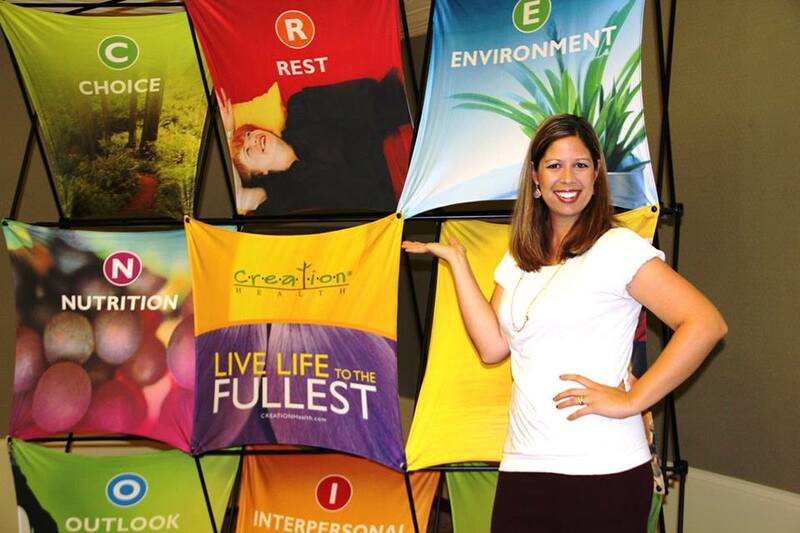 This past week has been crazy busy in the life of Creation Health - Greene County! I usually blog about each event I am apart of, but this week I am going to have to do a few combo posts in order to keep up! First, I had the privilege of speaking at the Takoma Volunteer Luncheon, to give an overview of the Creation Health program and how we are implementing it here in Greene County. The very next day I had the honor of speaking at a ladies luncheon out in Camp Creek, sharing with them the 8 guiding principles to abundant life. Seriously, how beautiful is this table spread? And the food was delicious! Pictured above is a healthy BLT, made with turkey bacon and fresh homegrown tomatoes. A gourmet peach salad was also served. Yum! Finally, I had the opportunity to speak at the Takoma Breast Cancer Support Group meeting and what a blessing it was for me! Not only did I share the links between a Creation Health-y lifestyle and cancer prevention, but also the hope that we have in Christ, no matter our circumstances! Let us know if you need a speaker at your next event! In 1 Samuel 17: 33 & 37, Saul said to David, "You are not able to go against this Philistine (Goliath) and fight him; you are only a young man, and he has been a warrior from his youth." David replied, "The LORD who rescued me from the paw of the lion and the paw of the bear will rescue me from the hand of this Philistine." To which Saul replied, "Go, and the LORD be with you." Now, I don't know about you but watching sheep all day does not seem like the most exciting or even the most important of activities, yet that's exactly what God had David doing most of his young life. While his brothers were going to battle for the king, David remained close to home and faithful to his work as a shepherd. It was through this every day, ordinary activity that God did something extraordinary. All along, God had been preparing David for the greatest battle of his life. And He used David's experiences as a shepherd boy in the fields to shape him into a man after God's own heart - a man who would one day shepherd His people as their greatest king. This is the devotional thought, taken from "Creation Health Bible Stories: Insights for an Abundant Life," that I shared Tuesday morning at the Leadership Training @ 4H Camp, to kick-off the meeting. 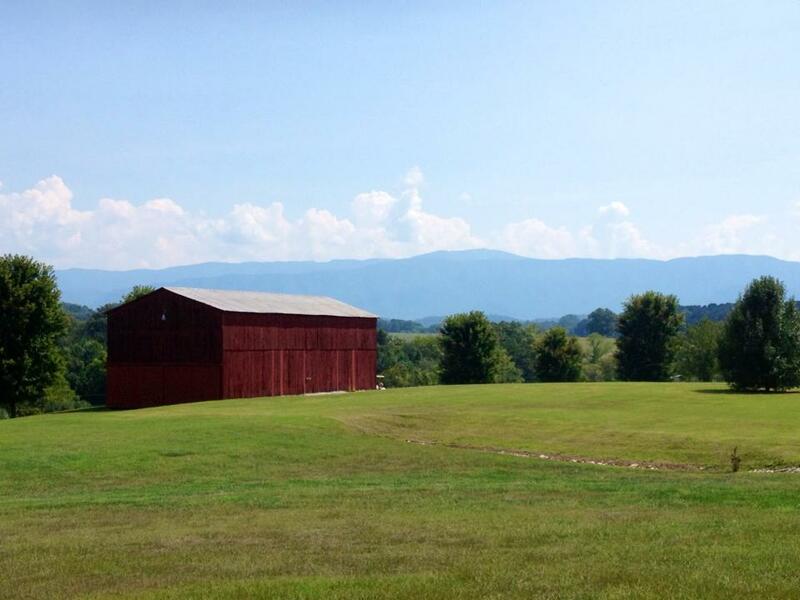 In the same way, I truly believe that God can use Creation Health to do a mighty work in Greene County. 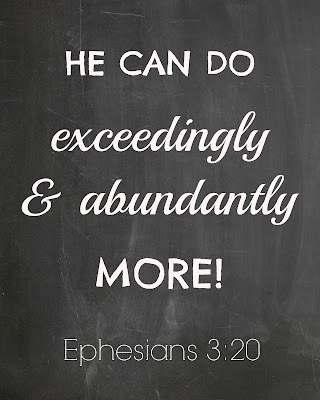 Even when our day-to-day job tasks seem monotonous, mundane, ordinary, even unimportant, He can bless our efforts just as He gave David success in his battle against the giant Goliath. It is my prayer that we would be diligent servants, knowing that God is faithful and that it is He who has the power to change lives. "Lord, please use this program for Your glory in Greene County...to change lives, to bring people into a relationship with You, to improve the physical, mental, emotional and spiritual health of every resident who lives here. Take our everyday, ordinary activities and use them to do something extraordinary for Your kingdom. Amen"
What about you? 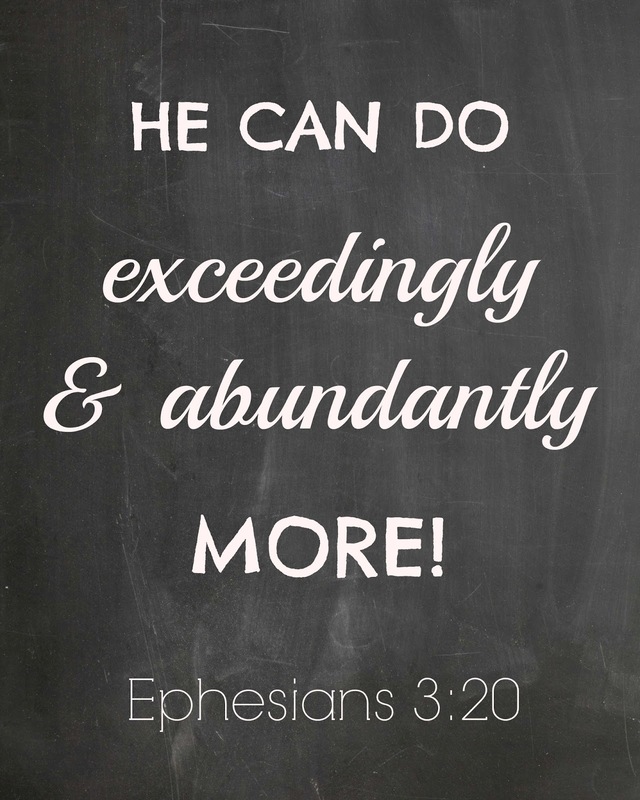 Do you believe that God can take the ordinary and make it extraordinary? Will you allow Him to use you right where you are today? Yesterday morning, leaders from both Takoma Regional and Laughlin Memorial Hospitals came together at the 4H Camp for Creation Health Leadership Training! Approximately 63 people were in attendance, to hear an in-depth teaching of the first 4 guiding principles of the Creation Health program. Attendants also learned how to select Creation Health Coaches, the hospital employees who will be responsible for finding practical ways to implement the 8 guiding principles in their department/floor/area, as well as motivating and encouraging their co-workers to lead a Creation Health-y lifestyle! Over the next few months, coaches will be trained and hospital leaders will return for the second half of the leadership training, where they will learn the last 4 guiding principles along with integration strategies! The 4H Camp was the perfect location for our purposes...absolutely gorgeous and very natural! Plus, the weather was beautiful! We served a wonderful breakfast spread including fresh fruit, muffins, granola bars, a yogurt bar, an oatmeal bar and drink choices of water, coffee, juice and milk! Each attendent received a Creation Health Study Guide, water bottle and one lucky winner from each table got to take home the lovely mum centerpieces! All in all, it was a great day and a successful time of training! Let us know how we can help your company become a Creation Health-y company! Creation Health has an easy, delicious recipe for homemade applesauce and I finally got a chance to try it out this week! As expected, it did not disappoint, which is why I am sharing it with you! Because "the closer the food is to the way God made it, the better it is for you," I am trying to fill our home with more fresh, whole, natural foods...less processed, pre-packaged junk...more colorful, well-balanced meals! The problem with this type of menu is that it takes alot of planning and preparation, or at least alot more than the other option! My goal is to find recipes that are not only healthy and delicious, but easy and family-friendly as well. When I find them, I will post them here, hopefully once a week or so. That said, here is the recipe for fresh homemade applesauce...enjoy! 1. Place apples in a 5-quart pot. Add sugar, cinnamon, lemon juice and vanilla. Add just enough water to cover half the apples (to prevent a watery sauce). 2. Bring apples to boiling; reduce heat. Simmer until apples are soft about 10 to 12 minutes. 3. Hand-blend or mash apples to desired consistency. Serve warm or cold. Oh and if you skip Step #3, you will have delicious cinnamon apples instead! Yesterday, my family and I went hiking at Horse Creek, to check the final item off of our summer bucket list! While we were at it, we also had a picnic and went on a bike ride! 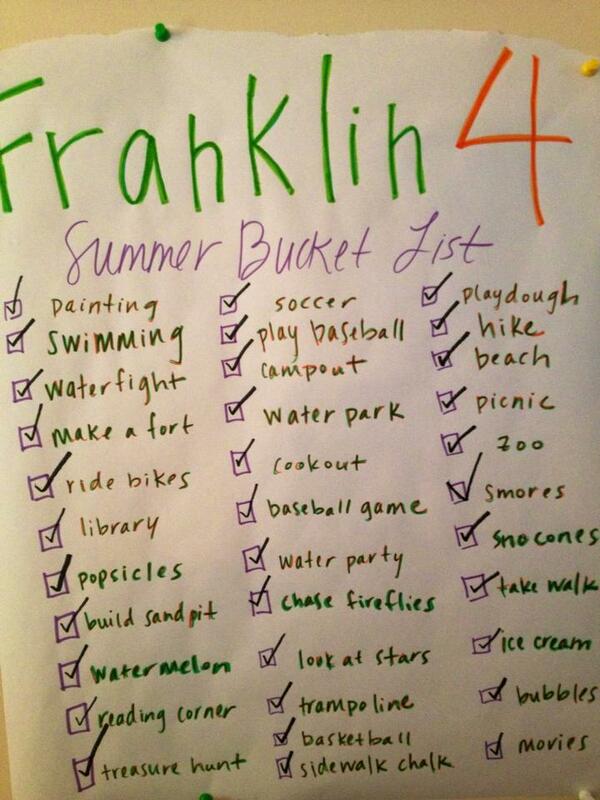 What is a summer bucket list, you ask? 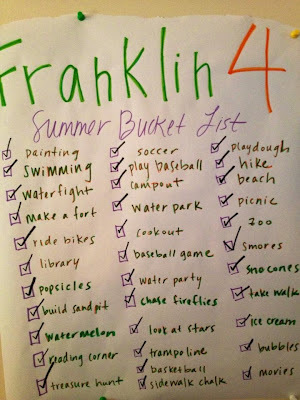 Basically, a list of activities that we wanted to accomplish together before the summer ended. We sat down at the end of the school year and made our list together, then we hung it on the wall in our kitchen and checked off items as we completed them. It is a great way to spend time together building relationships, while staying active! Did you know that the presence of loving relationships in your life can make the difference between sickness and health? Read more here. Go here for 5 Fun Ways to Stay Active as a Family and stay tuned for some fabulous ideas for a Fall Bucket List!